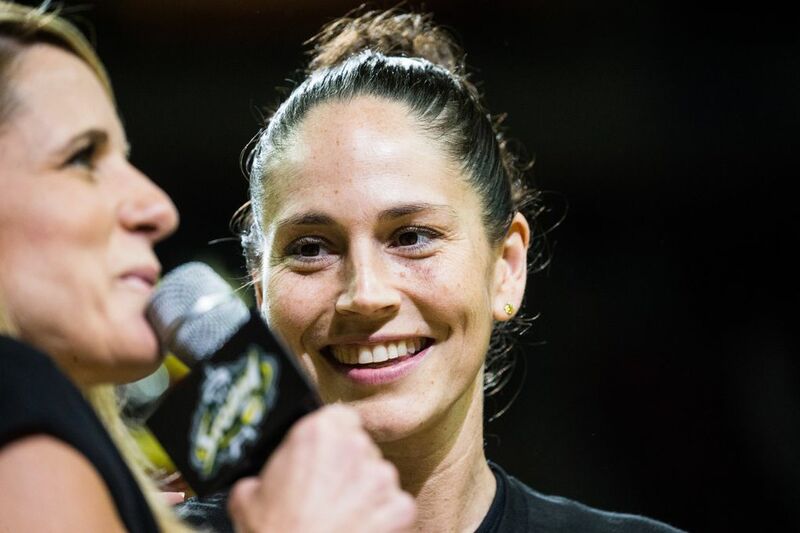 Sue Bird: "We can't wait to raise this flag and get this party started." 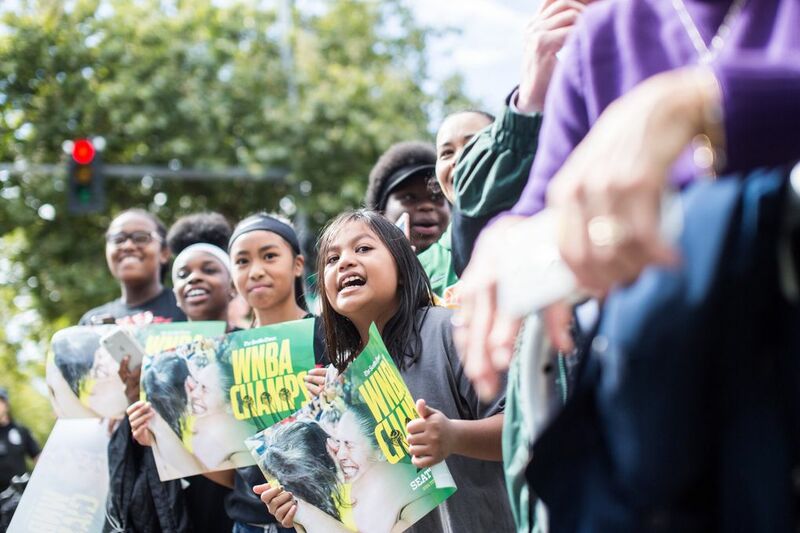 That they did, beginning a day of celebrating the Seattle Storm's third WNBA title that culminated in a rally at KeyArena. 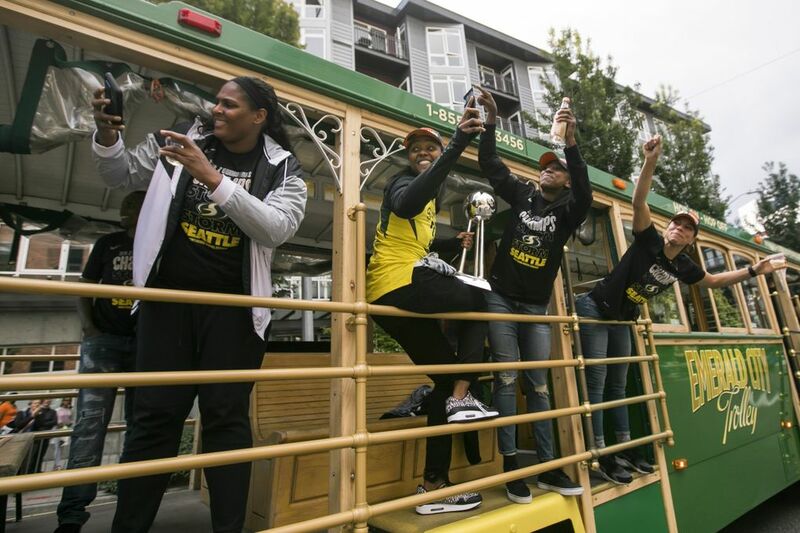 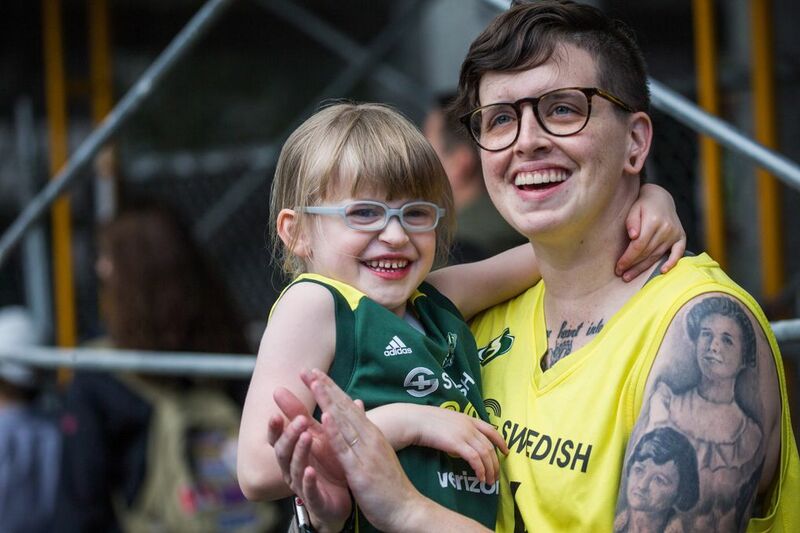 From high atop the Space Needle rooftop, down to a parade in the streets and ending with a raucous rally at KeyArena, the Storm celebrated its third WNBA title on a Sunday jam-packed with festivities. 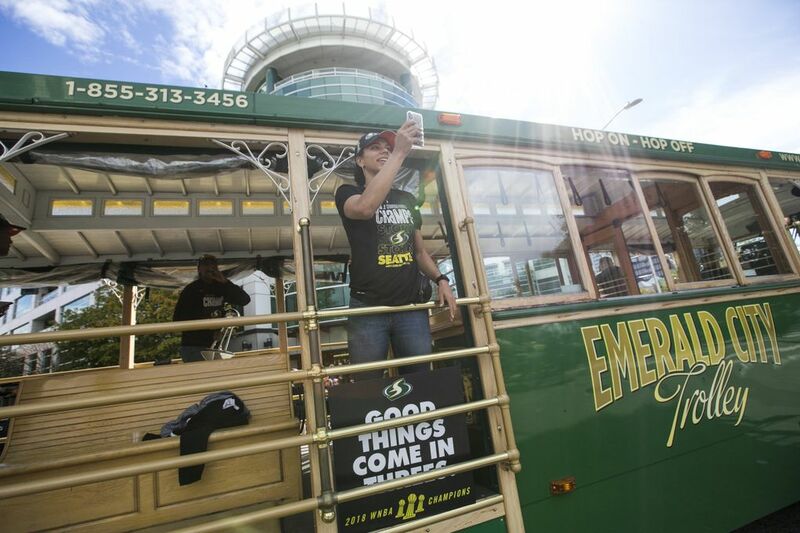 This party started early and had a little bit of everything. 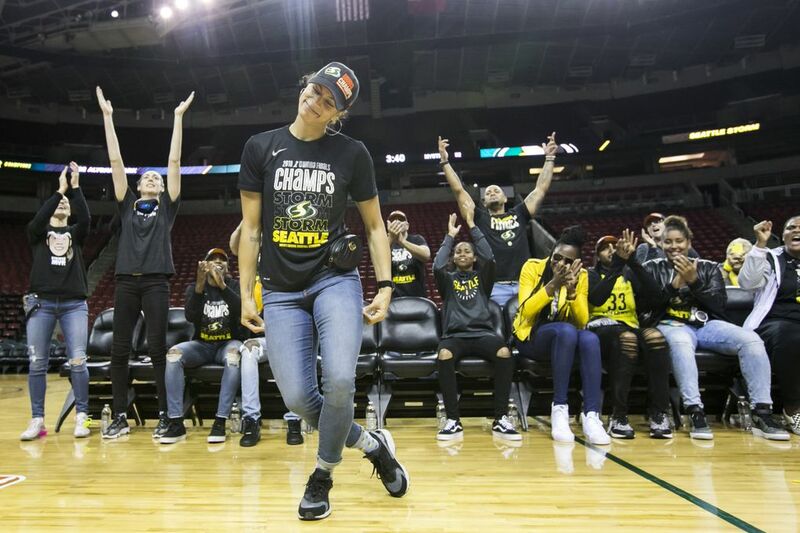 After a three-game sweep against the Mystics last week just outside of Washington, D.C., to capture its third league title, the WNBA champions returned home for a coronation befitting a queen. 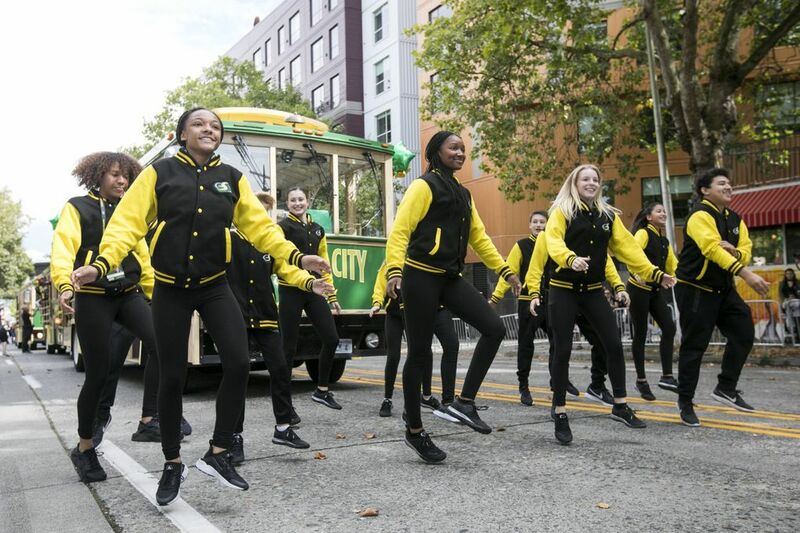 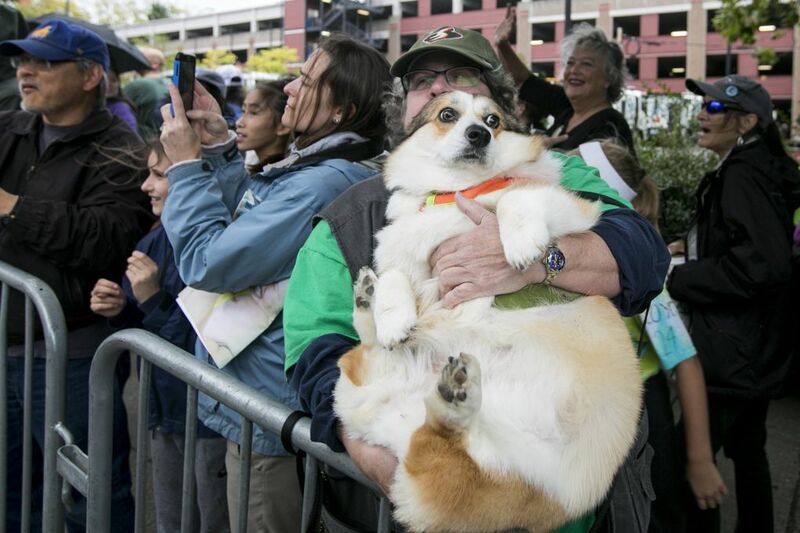 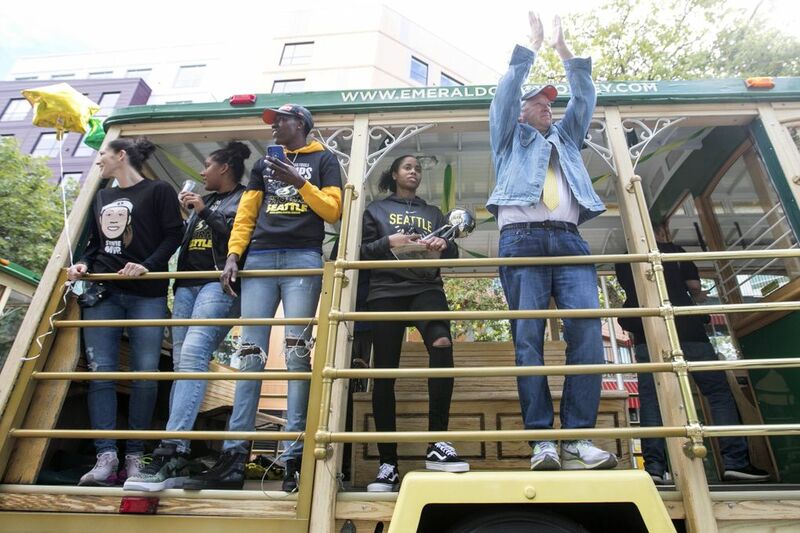 Thousands of smiling and howling fans lined the sidewalks to cheer players who rode aboard three trolleys that made a slow, meandering crawl along a 0.6-mile route through streets around the Seattle Center. 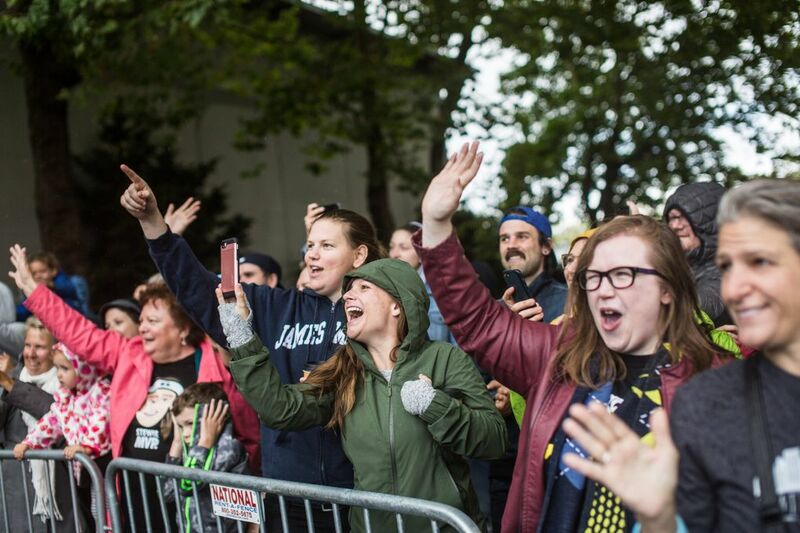 “Seattle has turned out the entire time for us,” president and general manager Alisha Valavanis said. 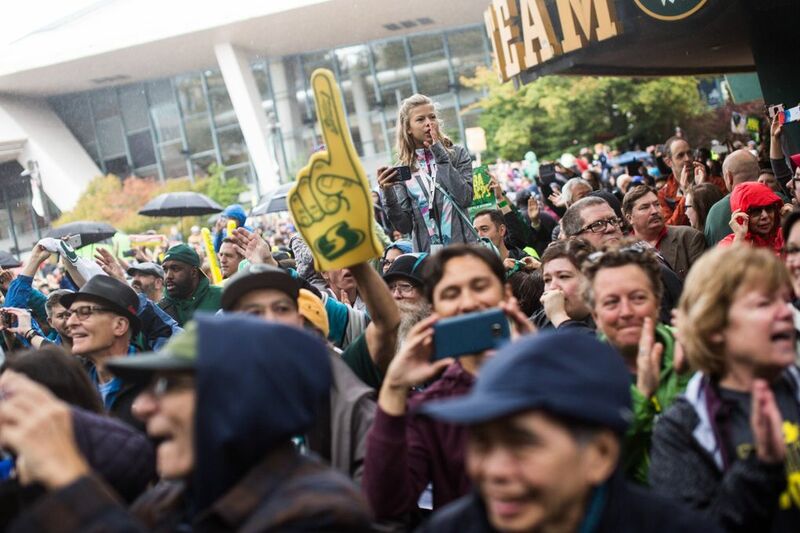 “They got us through the playoffs. 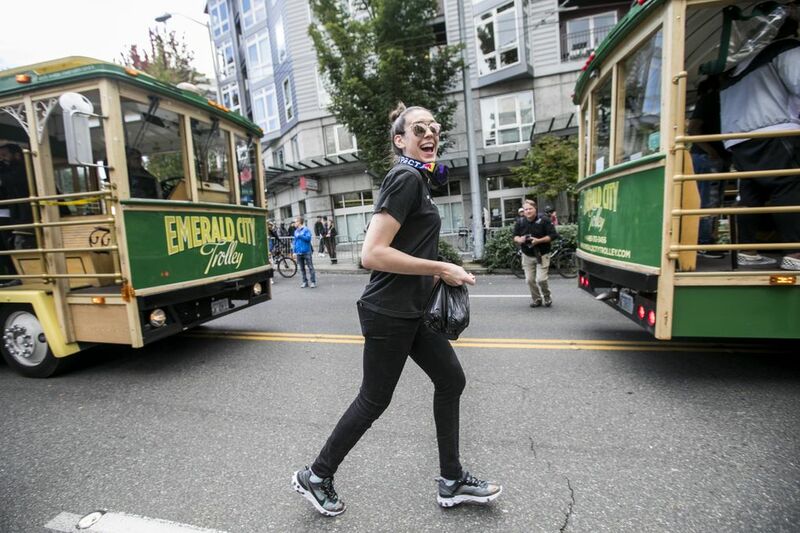 And it’s exciting to see them lining the streets today. 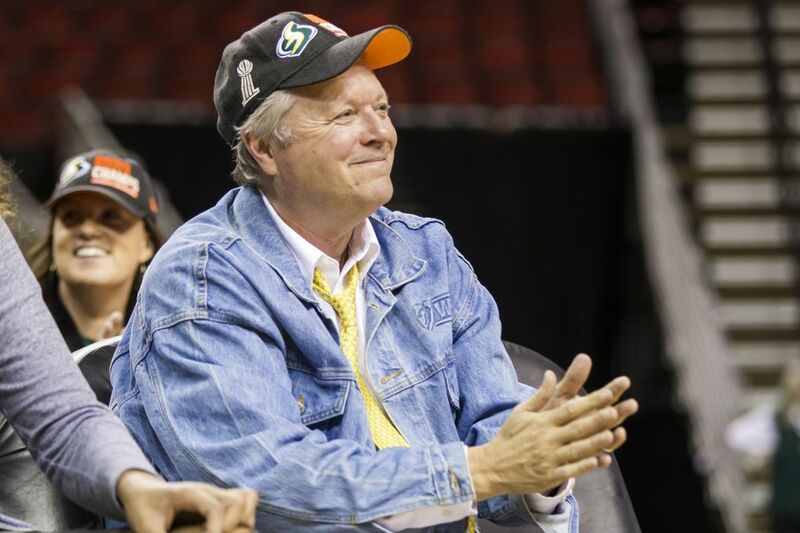 For Storm owners Lisa Brummel, Ginny Gilder and Dawn Trudeau, it’s their second WNBA title and the perfect gift to commemorate the 10-year anniversary of buying the team in 2008. 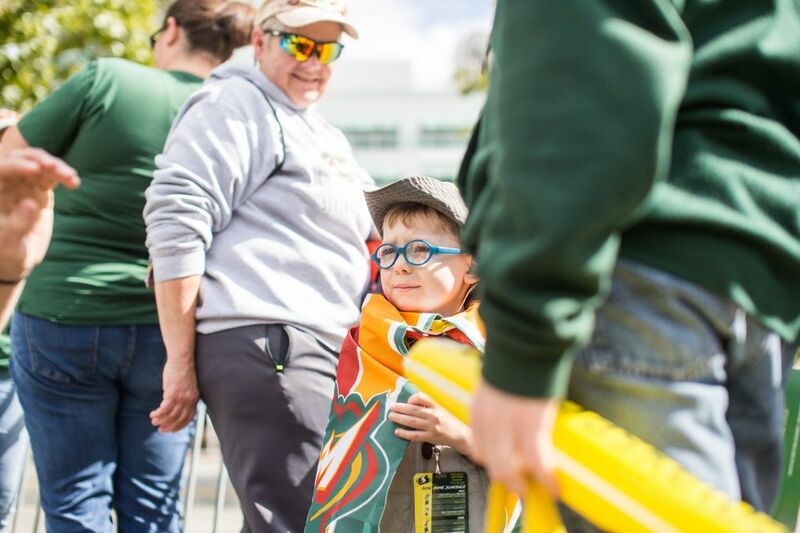 “We’re continuing a legacy that started with Ginger Ackerley,” Gilder said referring to the Storm’s founder and former chairwoman who died in January. 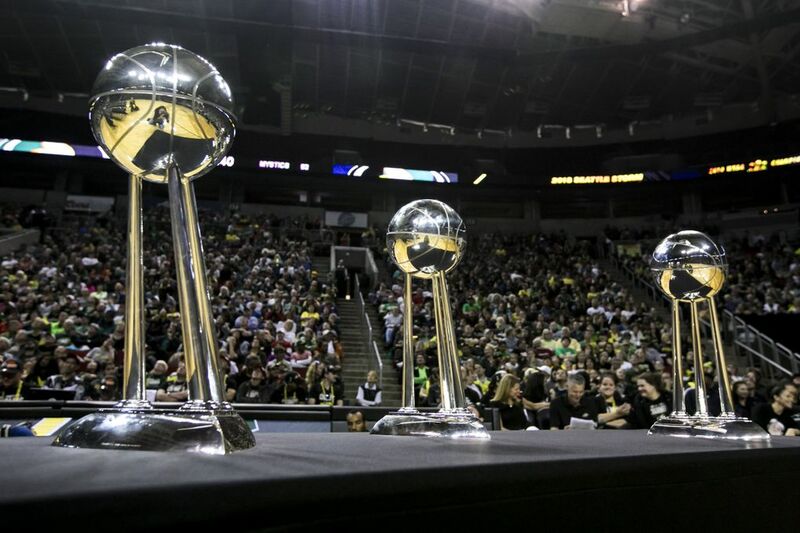 “This team belongs to the city. 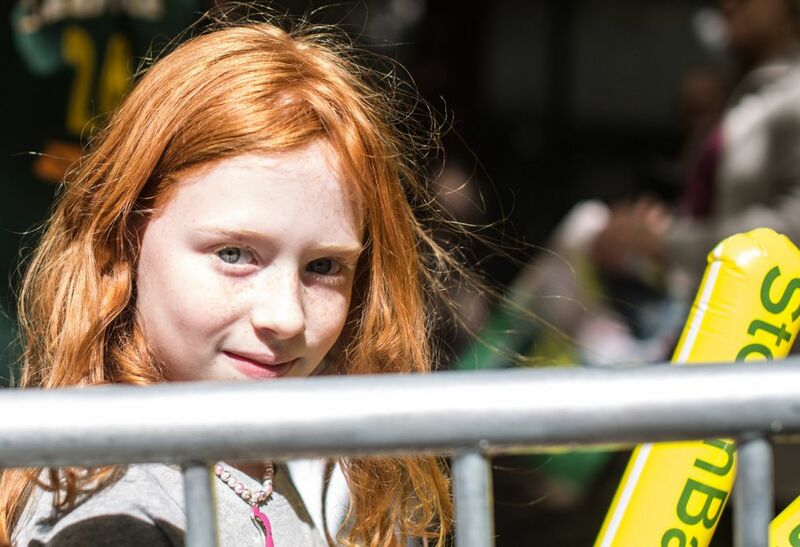 Next year is our 20th anniversary as a franchise and it’s our responsibility to be the caretakers of a community asset. 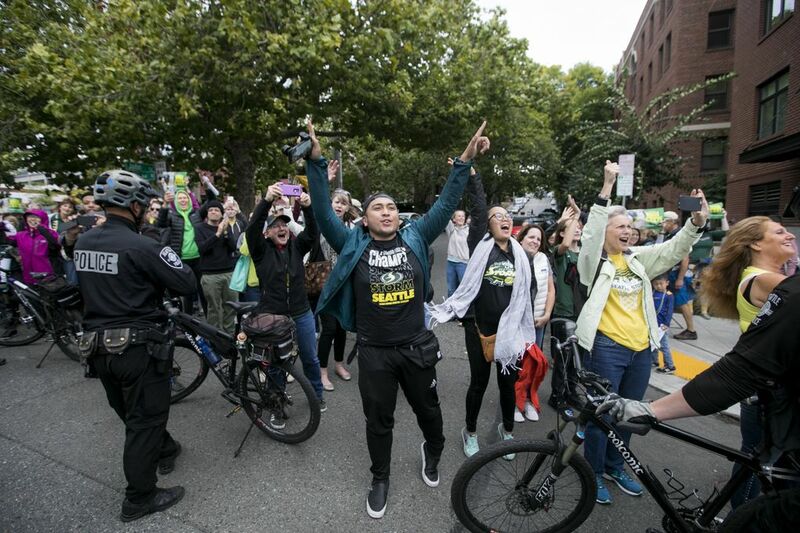 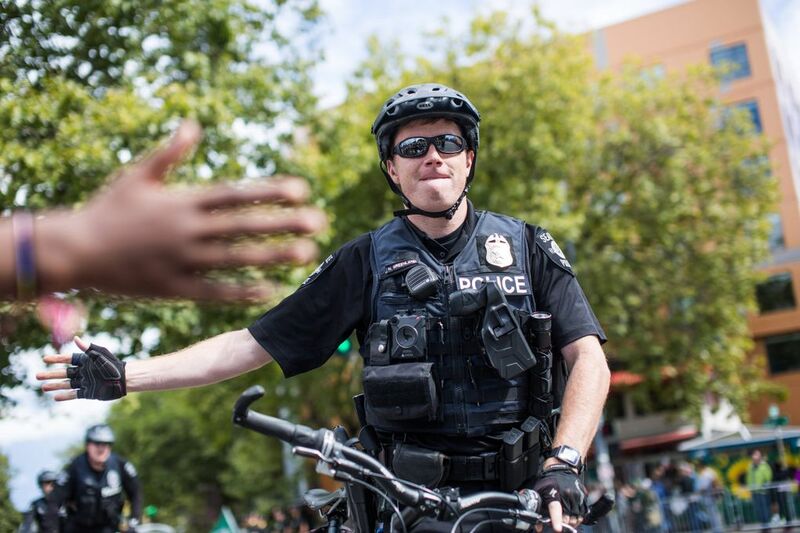 The police-escorted parade began at 1 p.m. beneath sunny skies, but 40 minutes later storm clouds rolled in and a downpour drenched the Storm and its fans as they entered KeyArena for more celebrations. 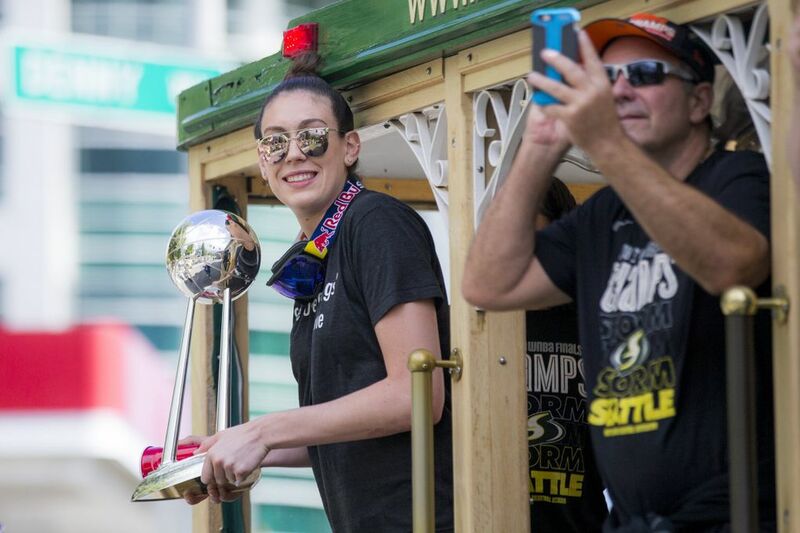 “It’s amazing to be able to share success with a city like this,” said league and Finals MVP Breanna Stewart. 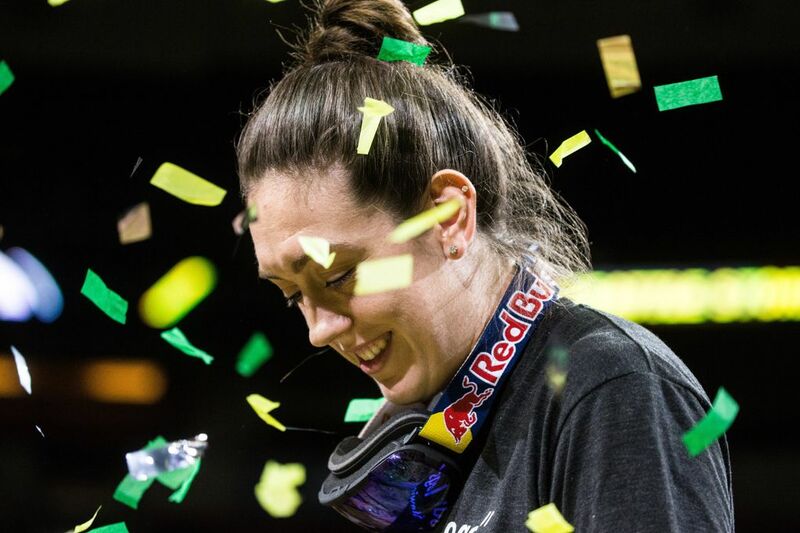 “I’ve done it at UConn and we’ve always been embraced in the state of Connecticut. 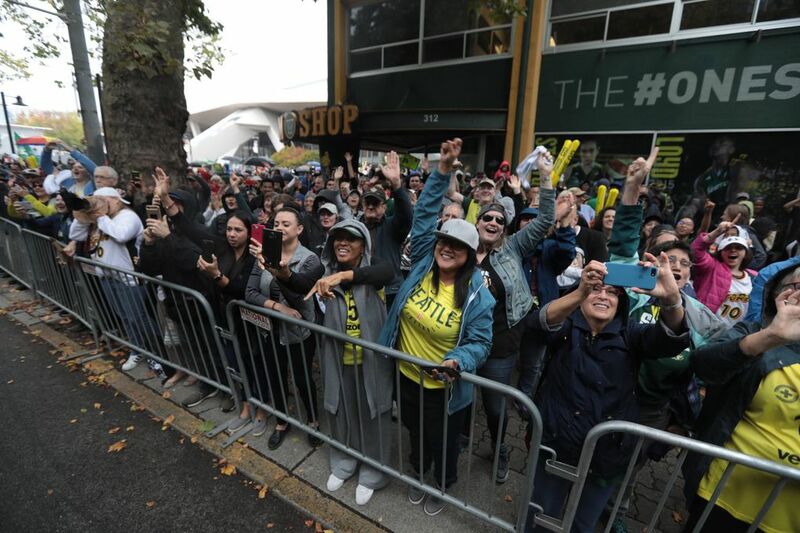 But now to do it here in Seattle, such a sports city, it’s amazing. 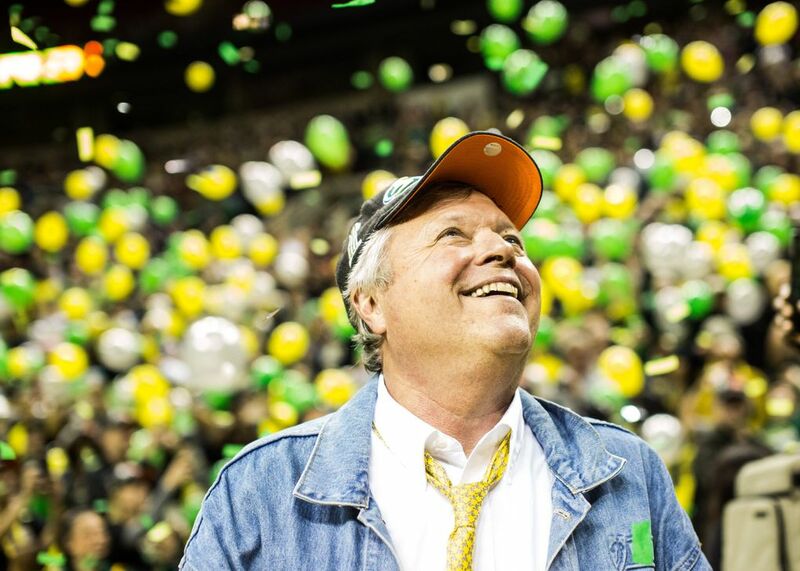 The old building, which begins a two-year, $700 million renovation next month, erupted in cheers one last time this season during a 75-minute rally that included three video tributes and a half-dozen interviews. 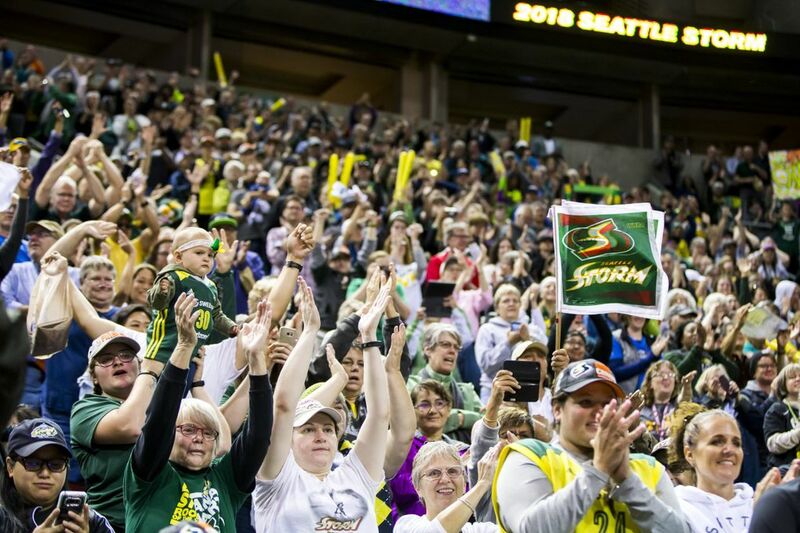 Neither the Storm nor its fans wanted to say goodbye and close the chapter on a remarkable year, in which Seattle went 26-8 in the regular season and 6-2 in the playoffs. 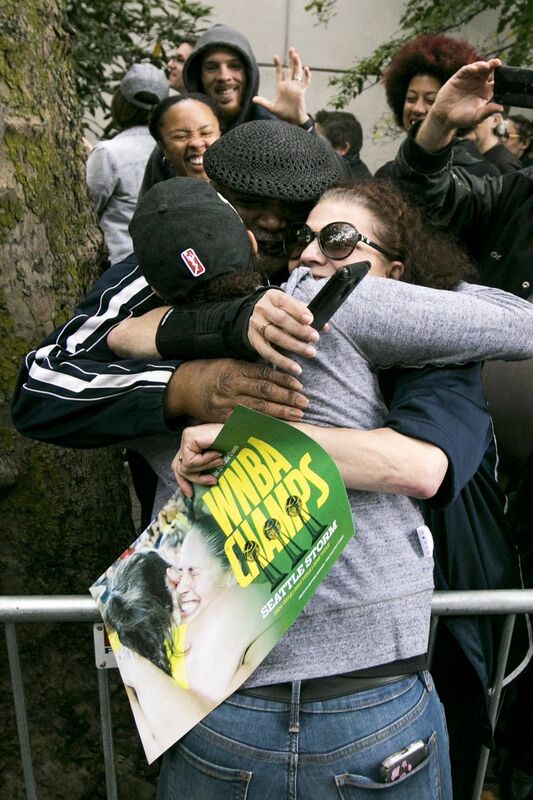 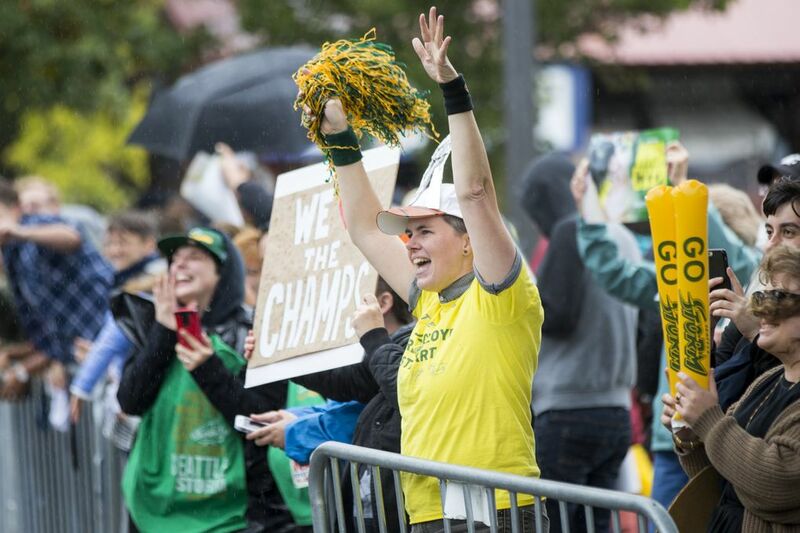 “If the Sonics had done what they did and win their third title with a sweep, this city would be on fire,” said former Sonics great Shawn Kemp, who sat courtside during the rally. 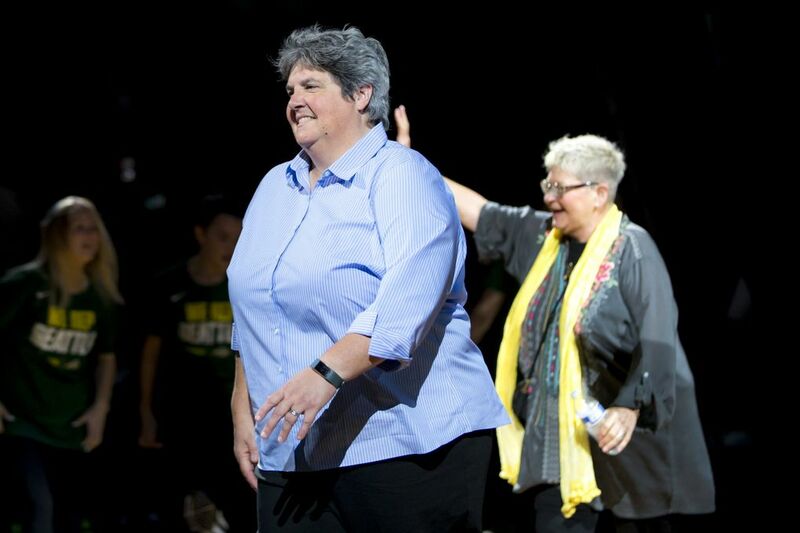 “These ladies deserve their respect. 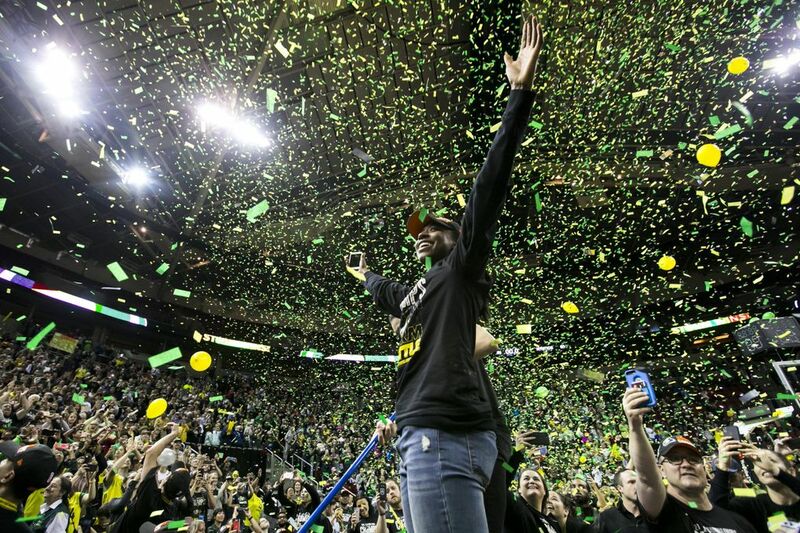 More than 6,000 fans inside KeyArena saved their loudest cheers for Sue Bird, who wore a black ‘Stewie MVP’ T-shirt. 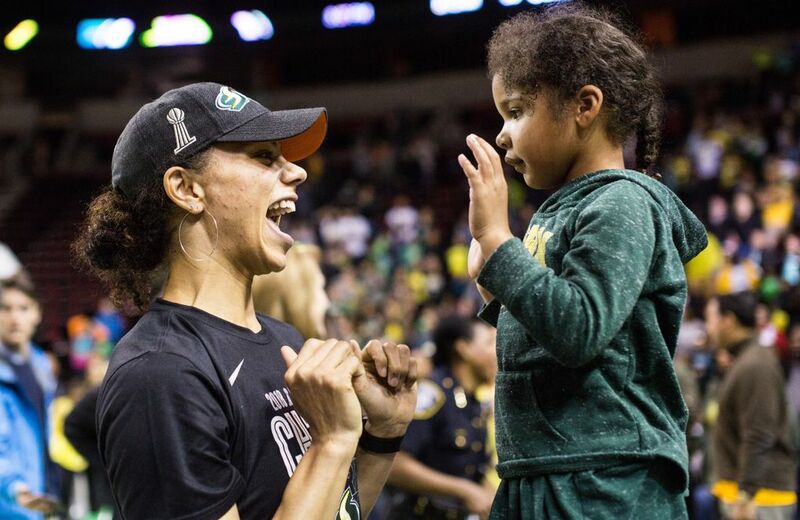 And clipped to her belt was the plastic face mask — her newest accessory that’s made her a cult hero – that she wore in the final four playoff games to protect her broken nose. 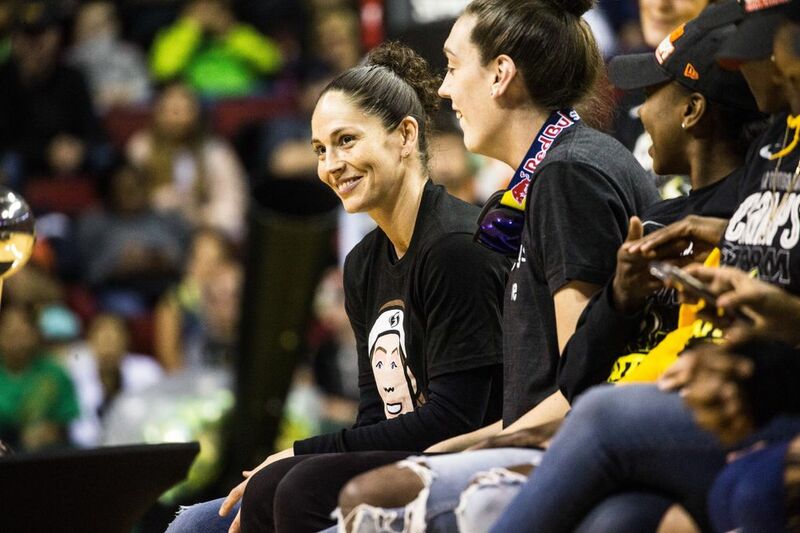 The league’s oldest player who turns 38 next month said she’ll return next year for her 17th season – an announcement that sent her teammates and the crowd into a frenzy. 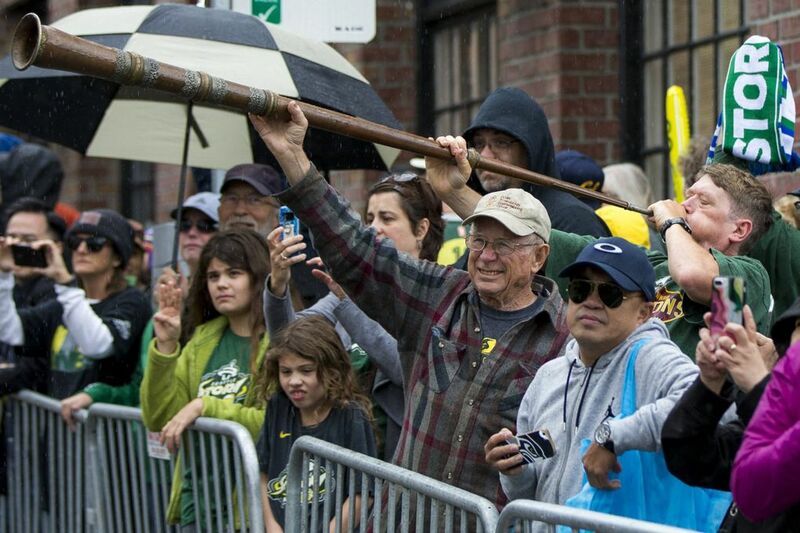 It really wasn’t much of a surprise, but Bird did reveal when she knew the Storm would capture the sweep. 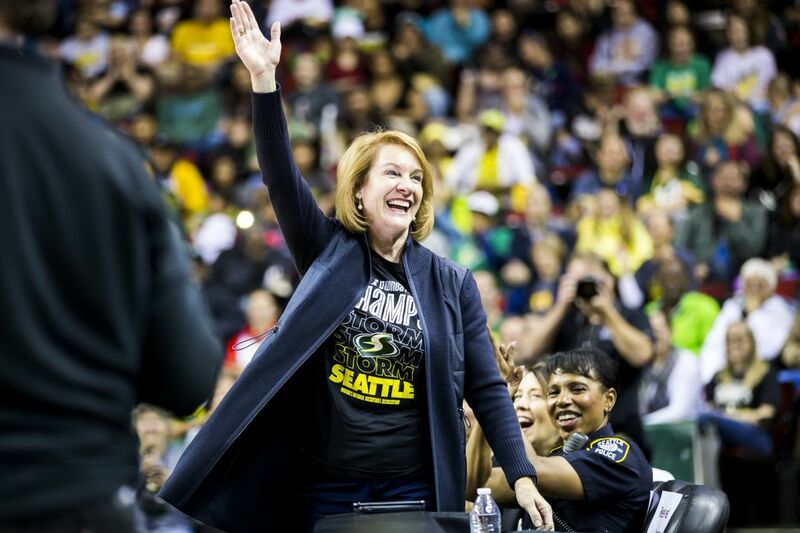 — Durkan also hinted at building a statue for Bird after the Hall-of-Fame-bound point guard retires. 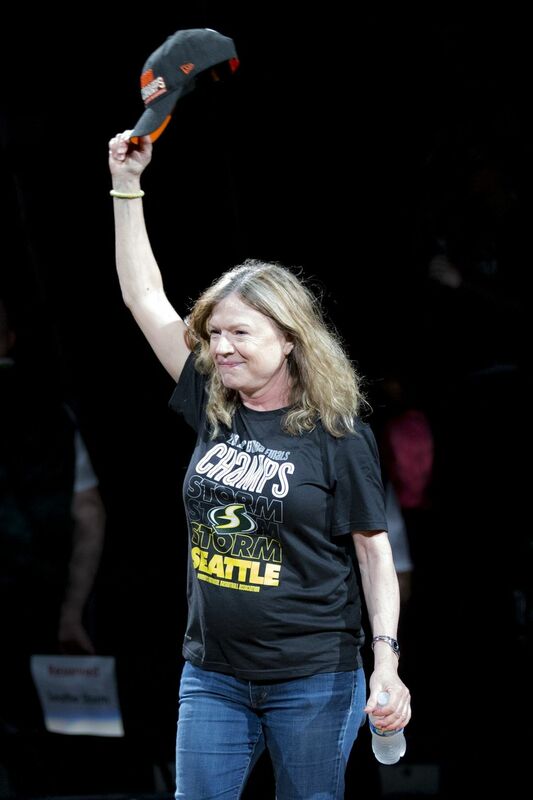 — During a video montage depicting Bird’s Game 5 heroics in the semifinals, Stewart dragged Bird on the court as the crowd cheered. 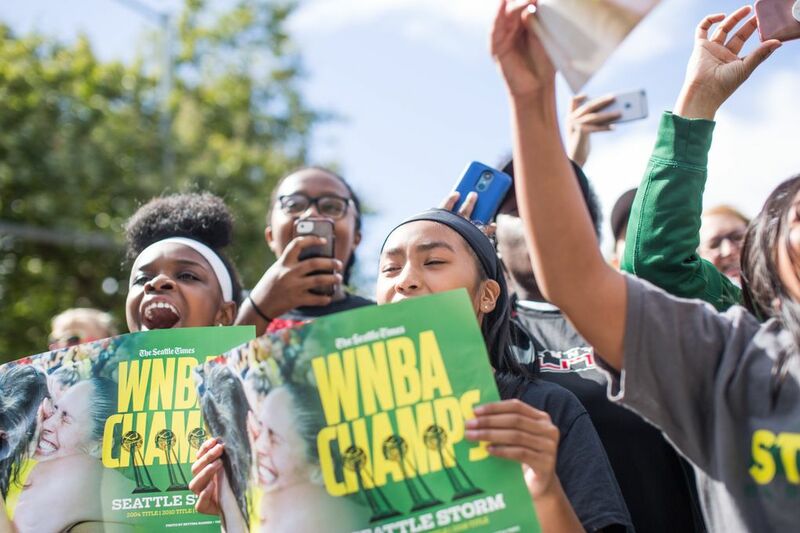 Despite her protests, the Storm players lifted their leader in the air. 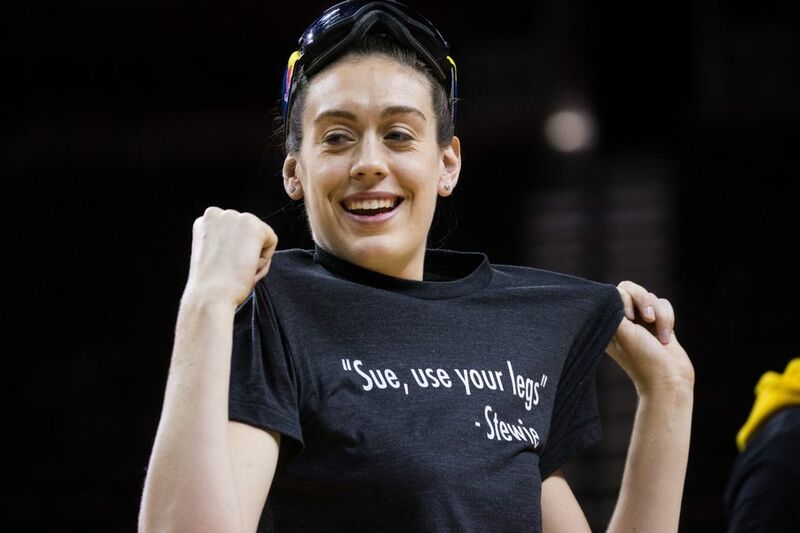 — Speaking of Stewart, her shenanigans were particularly entertaining. 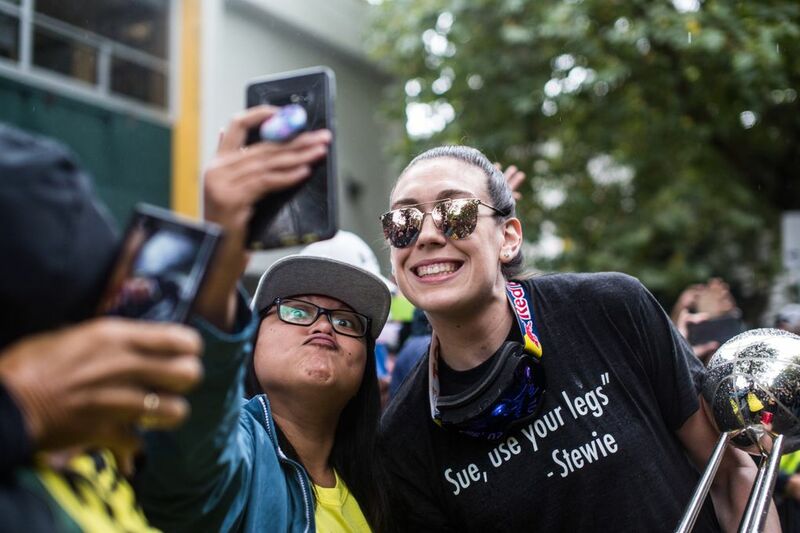 Wearing mirrored sunglasses and a black T-shirt that read ‘Sue use your legs. 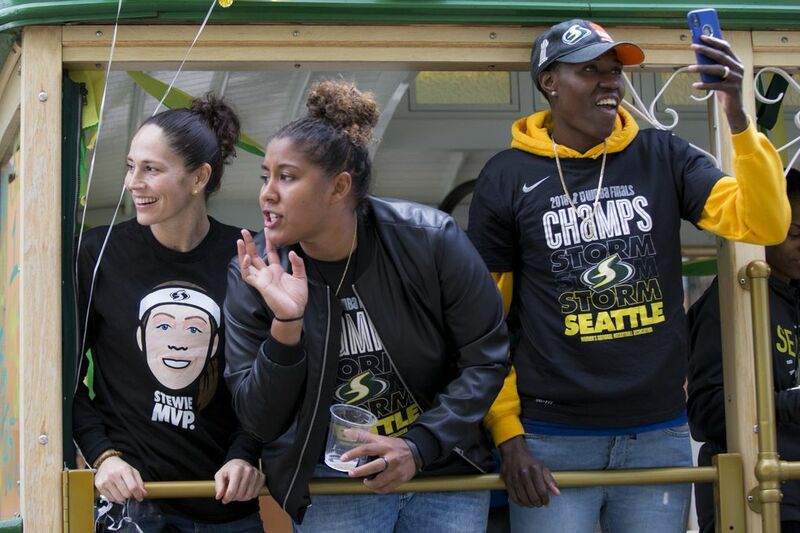 – Stewie” she playfully interacted with teammates, fans and media during the parade. 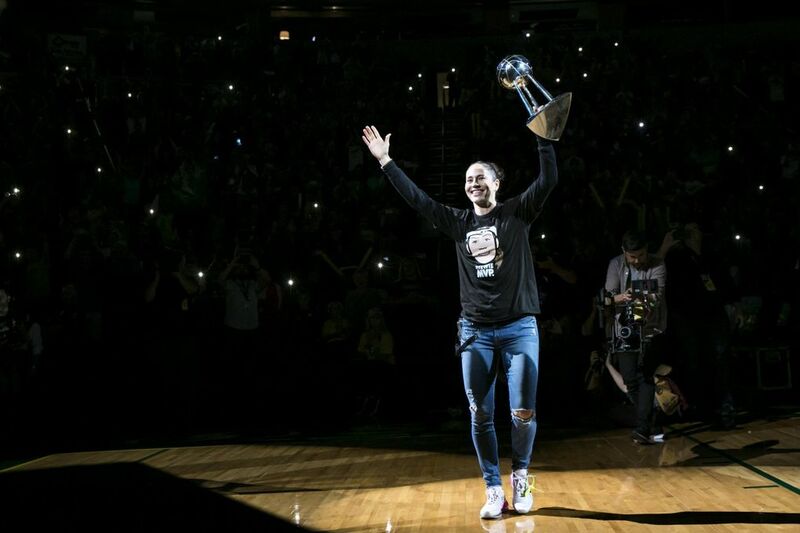 The 24-year-old star had the WNBA trophy in one hand and a plastic red cup in the other, sparking questions about her beverage choice. 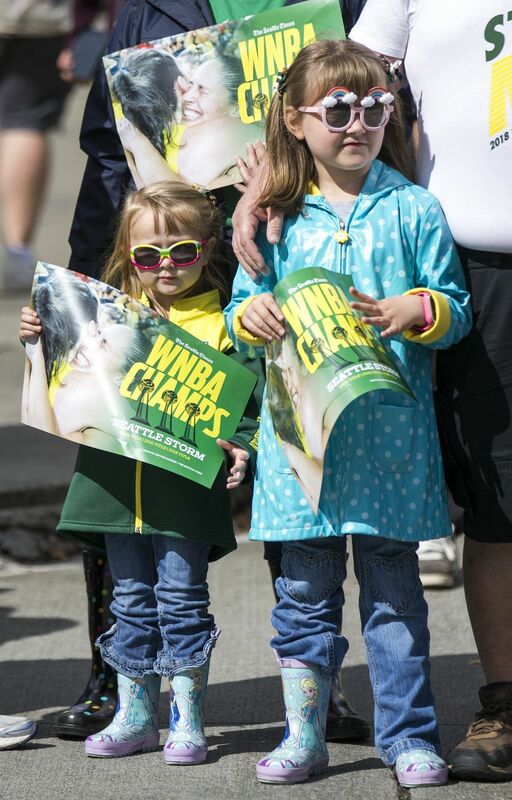 — Near the end of the parade, Alysha Clark jumped off the trolley and ran into crowd for kisses, hugs and a selfie with her mom and dad, Jan and Duane, who took a morning flight from Mount Juliet, Tenn.
— Crystal Langhorne, the third-longest tenured Storm, talked about the road back to a title after enduring 12- and 10-win seasons during her first two years in Seattle. 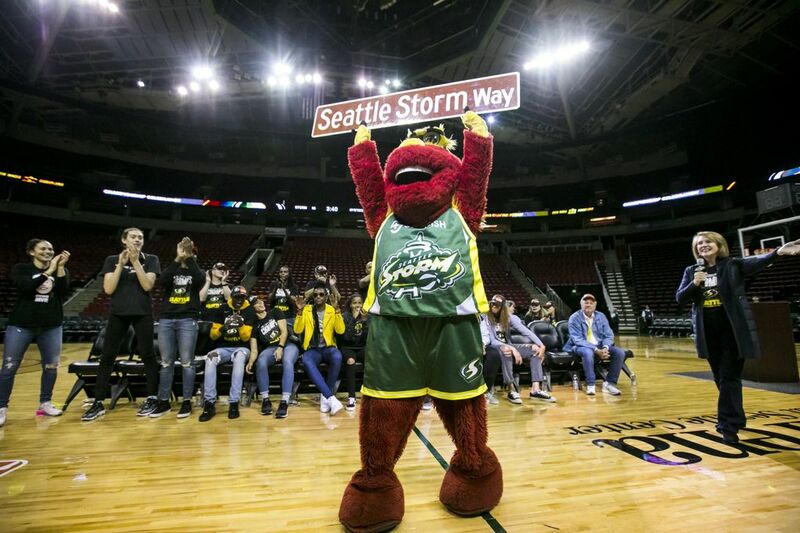 — Storm mascot Doppler served as the unofficial grand marshal of the parade and rode on the roof of a slow-moving SUV. 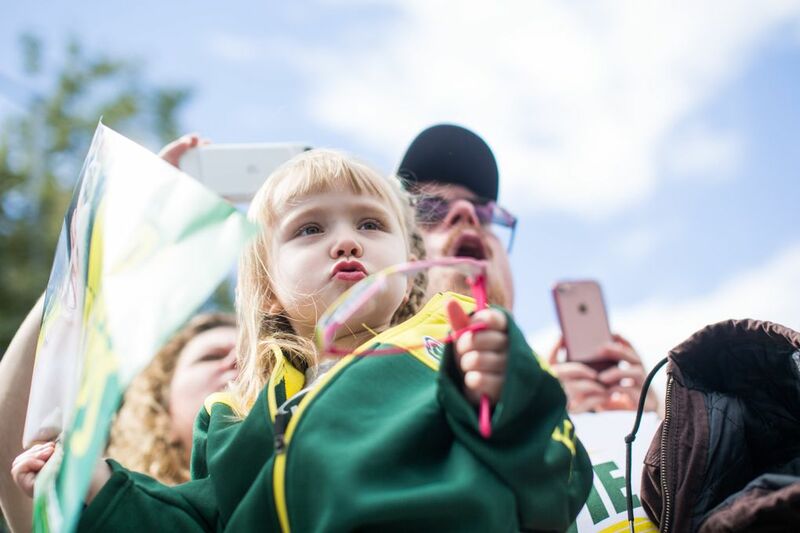 “We love the team and my daughter really loves Doppler,” said Michael Houser, who lives in Issaquah and brought his 1-year-old Clementine to the parade. 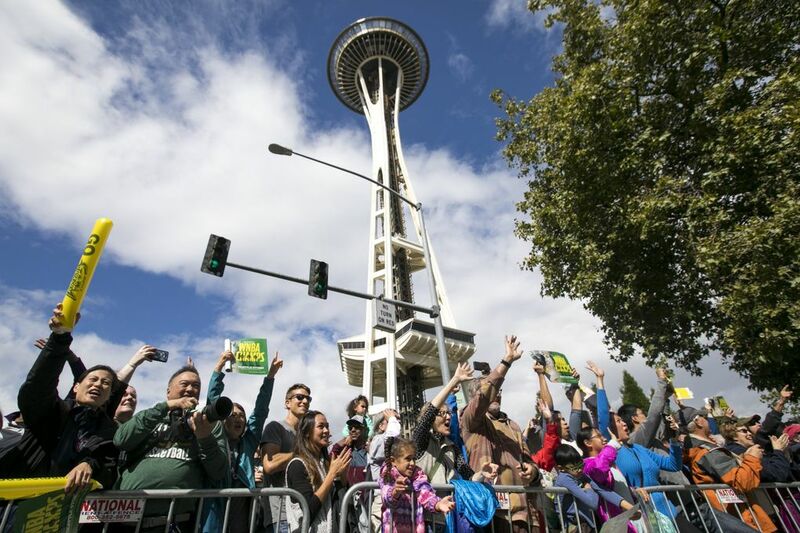 — Hours before the parade, the Storm ascended to the Space Needle rooftop to raise the team flag. 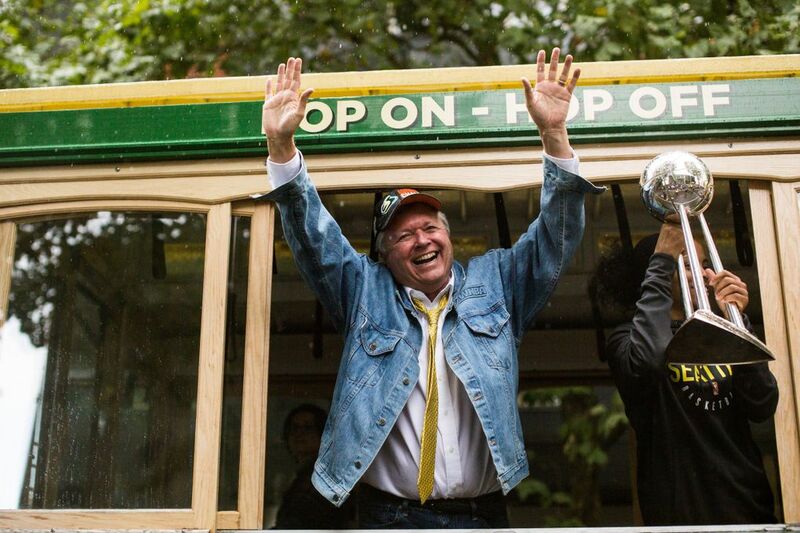 The celebrations ended with Stewart hinting that the party is just beginning for the Storm. 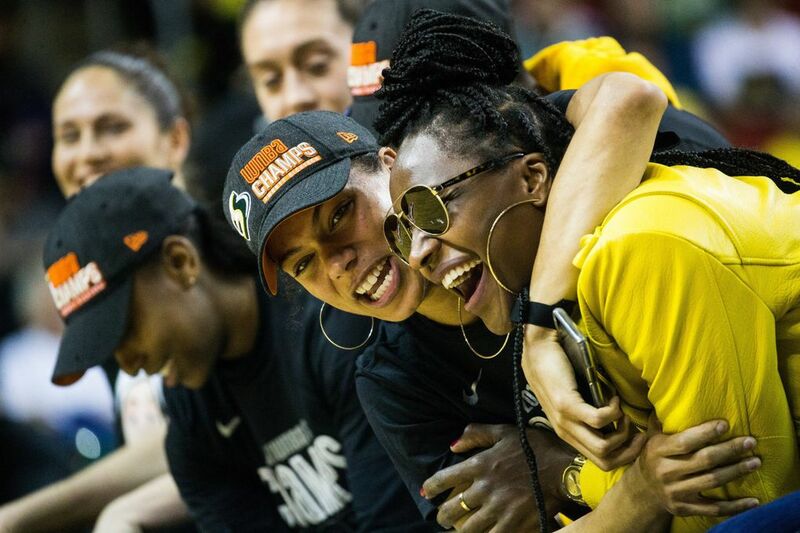 As the fans streamed out of the building, the scoreboard at KeyArena read: Storm 98, Mystics 82 – one last reminder on a season that won’t soon be forgotten.